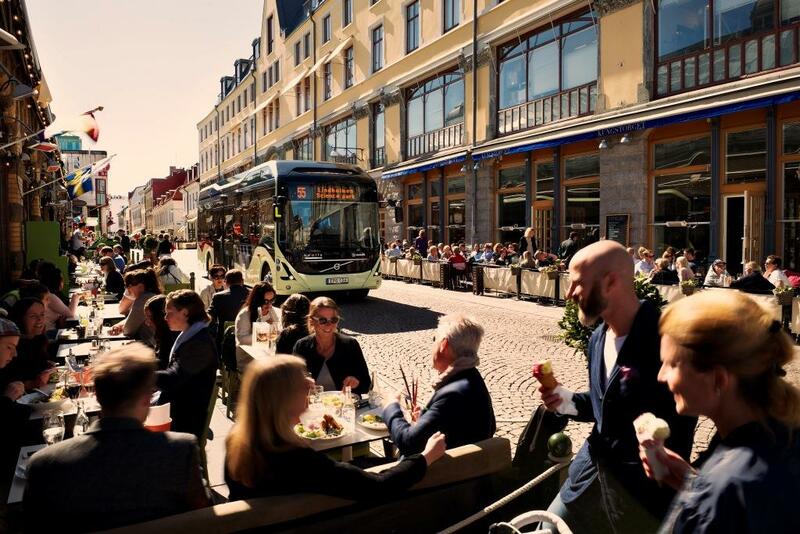 The City of Gothenburg and AB Volvo realized that they share the same vision of developing a sustainable public transport system and demonstrating it in Gothenburg, home of the AB Volvo headquarter. The idea of a common project was born. In Gothenburg, industry, researchers and civil society are now working together to develop, test and demonstrate solutions for the future sustainable public transport system. This cooperation stretches all the way to 2018 and goes under the name of “ElectriCity”. Its participants are the Volvo Group, the Västra Götaland Region, the City of Gothenburg, the Chalmers University of Technology, the Swedish Energy Agency, the Johanneberg Science Park, the Lindholmen Science Park, the Business Region Göteborg, Göteborg Energi, and Västtrafik. The first step in the co-operation was to have an electric bus running from Lindholmen Science Park on the Hisingen side of Gothenburg across the city center to the Chalmers Technology University campus. It was hoped that this first goal would be realized in time for the Volvo Ocean Race final stop in June 2015 in Gothenburg (approx. 18 months after the start of the project). On June 15, the new bus service was launched. The three demonstration buses run on renewable (wind) electricity. They are extremely energy-efficient, quiet, and entirely emissions-free. On board the buses, passengers have free access to wifi and information screens. The bus stop at Lindholmen is indoors. Quiet and emission-free public transport can operate in areas currently closed to traffic, thus opening up new possibilities for planning in cities and towns. Apart from the three all-electric demonstration buses, the route is served by a number of electric hybrid buses, powered by electricity for about 70% of the route. The second step in the cooperation is to develop ElectriCity into an open demonstration arena. More and more partners have been added since the beginning of the project. As part of ElectriCity, Gothenburg is now also creating a platform for the development and testing of services and products that can contribute to more attractive public transport. These services include new bus stop solutions, traffic management systems, and safety concepts, as well as systems for energy supply and energy storage. What’s more, new business models for sustainable mobility in the city will be tested. These should be able to be scaled up beyond the demonstration arena.